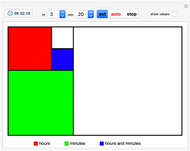 This Demonstration shows a clock based on time expressed using the first five Fibonacci numbers: 1, 1, 2, 3, and 5. Every integer from 1 to 12 can be expressed as the sum of a subset of those numbers, so that one can express hours and minutes in increments of 5 minutes. The clock itself is a rectangle divided into five squares with side lengths equal to the first five Fibonacci numbers. To tell the time, a color convention is needed: red is for the hours, green for the minutes, blue for both. The white squares are to be ignored. 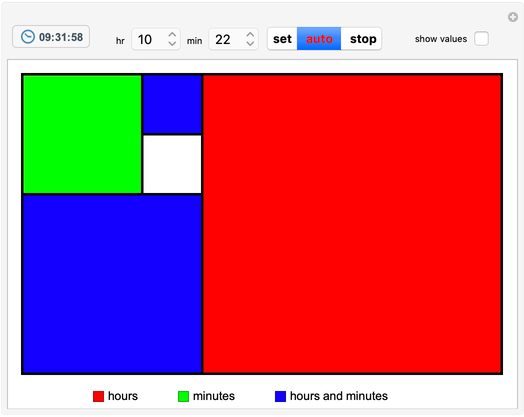 To read the hour, add up the values of the red and blue squares. 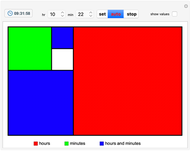 To read the minutes, add up the values of the green and blue squares and multiply by 5. The conversion of hours or minutes to "Fibonacci sums" is not always one-to-one, as an integer between 1 and 12 can be expressed by different sums. For example, 5 can be expressed as , , or and 10 can be either or This way, 5:50 can be expressed six different ways. The clock is refreshed every minute and chooses at random one of these possible representations. Note that all results are based on a 12-hour clock, even though the digital clock displays a 24-hour cycle. 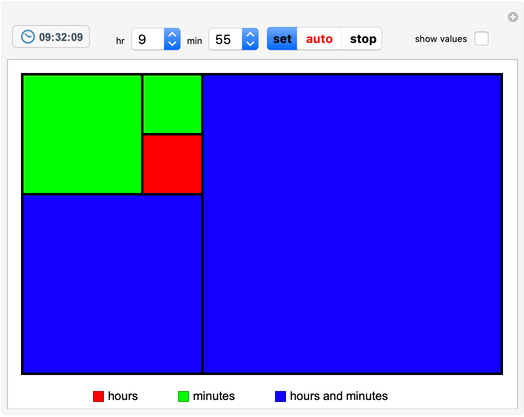 Use the "set" button to see the time's Fibonacci equivalent or click the "auto" button to start the clock in Fibonacci time. P. Chrétien. "Fibonacci Clock—An Open Source Clock for Nerds with Style." (Aug 27, 2015) www.kickstarter.com/projects/basbrun/fibonacci-clock-an-open-source-clock-for-nerds-wit/description. A. Bellos, "Fibonacci Clock: Can You Tell the Time on the World's Most Stylish Nerd Timepiece?" Adventures in Numberland (blog). (Aug 27, 2015) www.theguardian.com/science/alexs-adventures-in-numberland/2015/may/09/fibonacci-clock-can-you-tell-the-time-on-the-worlds-most-stylish-nerd-timepiece.